Well lookee there, Monday came to visit us again! That means it’s time for a little bit of magic…and I pulled out a stamp set that I finally moved from my wish list to my CART! Those happy little succulents and lizard just made me want to draw some cliffs and create desert scenes…so let’s go! Paper Smooches makes this adorable stamp set called Southwestern Charm; I combined it with Sunny Side Up so I could give our lil guy some glasses! Ha! Enjoy the video below, or click HERE to watch in HD on YouTube! Hope you liked that crazy background music – lol! I love to add a little bit of pep to my videos. The multiliner pens I used to draw the ground and cliff are HERE – just got them after waiting for months! I’ll do a whole video on them sometime to show you more deets – but you can get pens by the set or one at a time, and they don’t bleed with your Copics. PLUS they’re refillable and you can replace the nibs too. Rockin awesome! I picked the mix of colors for the cliff and ground from the Hex Chart – I started in the oranges, added rusts, then added yellow to be the sun shining on it (and it needed to be brighter), then added some bright orange on top. Original Markers: I have a number of colors in the “square” body often called the “original” or “Copic” style body. That’s because there’s an awesome bullet nib for drawing in details. I recommend getting a selection of your favorite detail or doodling colors in the body…I have about 25 of them and they’re really helpful! You can get them in sets, but also one by one here. The final touch was to add some dots of white pen – both the colorless blender Original and then some white Signo pen. 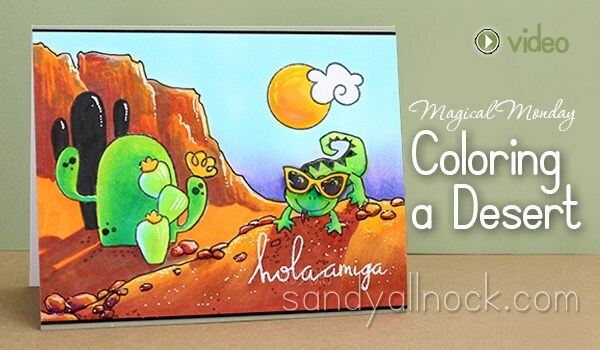 Some folks don’t find the Signo works but love the Gellyroll…either will do great for creating highlights in the sand of desert scenes! 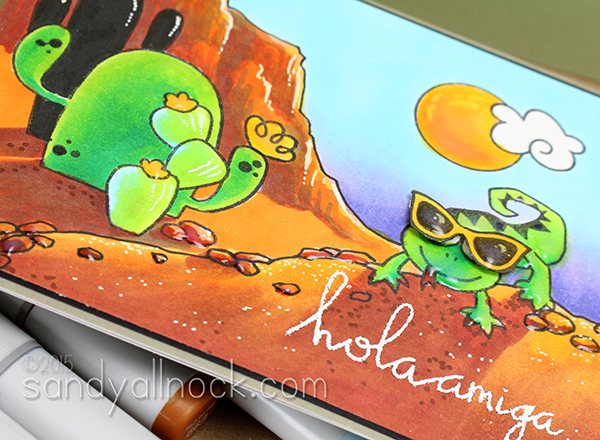 This was a fun little card for a Monday – hope you might try one of these desert scenes. Got any suggestions for settings for future Magical Monday videos? I just love your coloring. The music was fab too. Even my husband was waiting for Clint Eastwood to come walking from around the hill lol lol lol !!! Cute Sandy – how about some more underwater scenes? Thankeeee!!! Hope all your techy woes get solved quickly! Cute card. Love the sunglasses. I waited to watch this with my 10 y/o son. He LOVES to draw and color. I was commenting on where the light source was coming from and he looked at me like “duh!” and said, “you can see the sun is behind everything mom!”. Then you started adding the shadows with the BV color and I told him you do that for the skin shades, too. He said, “yeah. I know it seems a little weird. But it makes it so much more realistic”…. Another great card. Note to self, must win lottery soon to afford more stamps! OMG…watching you colour is just a real treat. I love seeing your scenes come to shape. Totally love this scene. You are amaze-balls! Love it. I also like the idea of a farm landscape. So many cute farm critter sets to use for it. You make these stamps feel alive. How about a farm scene with a barn in the background? My amigo! Sandy, everything you color turns to beautiful. A Copic marker, a paintbrush, an airbrush…..they all turn to magic wands in your hands! Art happens and out of your soul or creative genius comes the most amazing characters, landscapes, and elements. I love your work. Keep sharing! ABsolutely love your coloring; it’s just amazing. Thanks for the great tutorial and video. Wow!!! Amazing! Really enjoyed your video. I just love watching your coloring videos! I don’t have any Copics (and never will), but there’s something so magical about watching you color with them. Well, watching you color with EVERYTHING really! Thanks for sharing your amazing talent. P.S. Just saw the request for future background ideas. I’m thinkin, with all these cute farm critters that have been released lately, maybe a flatter landscape with fields of corn or wheat in the background..? Oh boy – I actually have this stamp set! And this looks like a background I might actually be able to pull off – whoopee. Love the music too, by the way… See, this is why I retired – so I could take a morning off to have fun playing with my toys and watching fun videos like this – thank you so much for making my Monday!